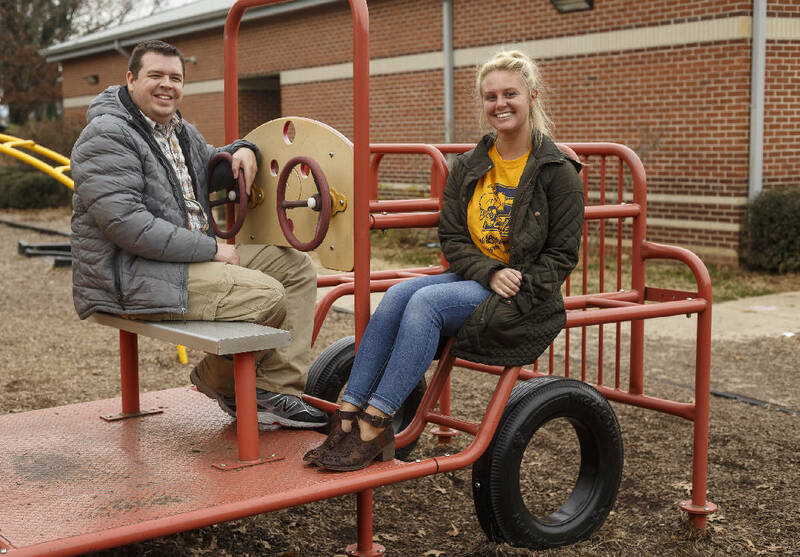 Second grade teachers Hannah Ellis, right, and Justin Payne pose for a portrait at East Lake Elementary School on Friday, Nov. 15, 2017, in Chattanooga, Tenn. Payne is Ellis's mentor through a UTC and opportunity zone mentorship program. East Lake Elementary School principal Joyce Lancaster poses for a portrait in her office at East Lake Elementary School on Friday, Nov. 15, 2017, in Chattanooga, Tenn.
Hannah Ellis comes from a family of teachers in Cleveland, Tenn., but she wasn't fully prepared for what she encountered when she stepped into her classroom at East Lake Elementary. "It's been a challenging year," Ellis said. "I learned things I never even knew I could learn." Ellis is the type of teacher that a new partnership between UTC's School of Education and Hamilton County Schools hopes to target and support. The UTC+3 program launched this week provides peer mentors, training and professional development, as well as a Summer Institute, for recent UTC graduates working in five Opportunity Zone schools. "We want to continue to recruit and retain the best teachers for our neediest students," said Kendra Duncan, clinical instructor at UTC's School of Education. "The goal of the UTC+3 grant is to specifically impact teacher effectiveness and student learning in these five Opportunity Zone schools." Ellis' mother was an assistant kindergarten teacher, her father taught high school, and her sister teaches pre-kindergarten. At first, Ellis didn't go to school thinking she'd be a teacher. Halfway through her time at the University of Tennessee at Chattanooga, though, she changed her major from communications to elementary education. During her senior year, Ellis completed her student teaching requirement at Apison Elementary, where she co-taught a first-grade class. After graduating, she interviewed for several schools, but ultimately accepted a second-grade teacher position at East Lake Elementary, one of 12 Opportunity Zone Schools. The Opportunity Zone, launched by Superintendent Bryan Johnson this fall, includes the district's lowest-performing schools, with the highest needs. The Opportunity Zone often has more vacancies than schools in other parts of the district, and due to high turnover has a large number of new or inexperienced teachers. UTC+3 pairs 15 new teachers with peer mentors at their schools in the Opportunity Zone: Clifton Hills Elementary, Calvin Donaldson Elementary, East Lake Elementary, East Lake Academy and Orchard Knob Middle School. Mentors were selected by their principals and trained in effective mentoring strategies. The program also lets participants attend two monthly modules that count toward their professional development requirements and cover topics the new teachers said they'd like more training on, such as classroom management. The partnership comes as Hamilton County Schools works on recruiting and retaining teachers, especially in the 12 Opportunity Zone schools that are the most difficult to staff. Earlier this year, Erin Harrell joined the district as a recruitment and field experience coordinator and Carmen Carson followed as a recruitment coordinator specifically for the Opportunity Zone schools. "As I recruiter, I'm asking myself, 'How are we going to support them once we get them there [and] what's the work that's going to keep them there?'" Carson said. "We are providing them with layers of support," she added. "Getting the teachers into a building and mentoring them like this is an extra layer. The next layer is having great admin, great coaches, building that capacity within the building." Hamilton County Schools does not have a formal mentorship or induction program for new teachers. Historically, that has been left up to principals or even individual teachers to seek out those relationships themselves. Clifton Hills Elementary Principal Lindsay Starnes remembers how as a brand-new teacher, wholly unprepared for an urban school, she sought out a teacher she admired for advice and support. "She wasn't my assigned mentor, but I sought her out," Starnes said. "I went to her for everything. I watched her teach. I wanted to be her; she taught me how to be an effective teacher." Starnes' mentor, Theresa Custer, is still at Clifton Hills, where she has taught since 1978. She is the lead mathematics coach now, but continues to mentor new teachers, including one of the UTC+3 mentees who will begin teaching in January. Over the years, Custer has seen a lot of teachers come and go and has gotten to know the community. "The No. 1 thing they always struggle with is management. Until you can establish rules and norms, you can't instruct," Custer said. "As soon as you step into the classroom, with little ones, you have to expect the unexpected." When a new teacher has a peer mentor, "you're working with someone who knows your struggles, you know they have insight," she added. Duncan said the mentors will lead instruction at the Summer Institute, which is being planned. They also receive a small stipend for their extra responsibilities. Additional resources will be provided by UTC's Butterfield Fellows, a group of six teachers identified for their classroom management skills and talent. The program itself, along with the stipends, is funded by a small grant from the University of Chattanooga Foundation. Renee Murley, director of the UTC School of Education, developed the proposal and worked with Hamilton County Schools' Jill Levine, chief of the Opportunity Zone, to determine the neediest schools. "Our goal with any partnership with a school district is always school achievement, and our second aspect is we want to retain these good teachers, because we know these Opportunity Zone schools are the neediest because of the academic challenges and the risk of the students," Duncan said. East Lake Elementary Principal Joyce Lancaster doesn't disagree. "We have to look at the needs of our environment," she said. "Of our students, 100 percent receive free and reduced lunch, 65 percent are [English language-learners]." Lancaster noted such challenges can affect teacher retention. 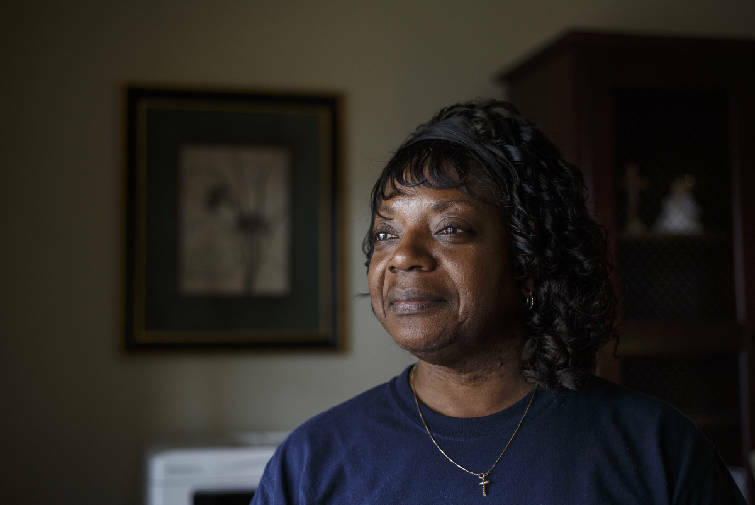 "Sometimes when you're at an urban school or an Opportunity Zone school, you get tired and aren't always able to see the gains in the population," she said. Ellis, whose mentor is the second-grade lead teacher at East Lake, is glad she has someone right across the hall she can go to for guidance. She, her mentor, Justin Payne, and the rest of the second-grade team plan lessons and curriculum together daily. They also spend time outside of school, getting to know and supporting each other. As part of the program, Ellis will have to videotape herself teaching lessons, which Payne then will review and critique. The two will meet regularly to go over his recommendations and discuss her progress. "We're in the same school, we all understand what's going on here, we all use the same techniques and tactics," Ellis said. "I've already learned so much already," she added.